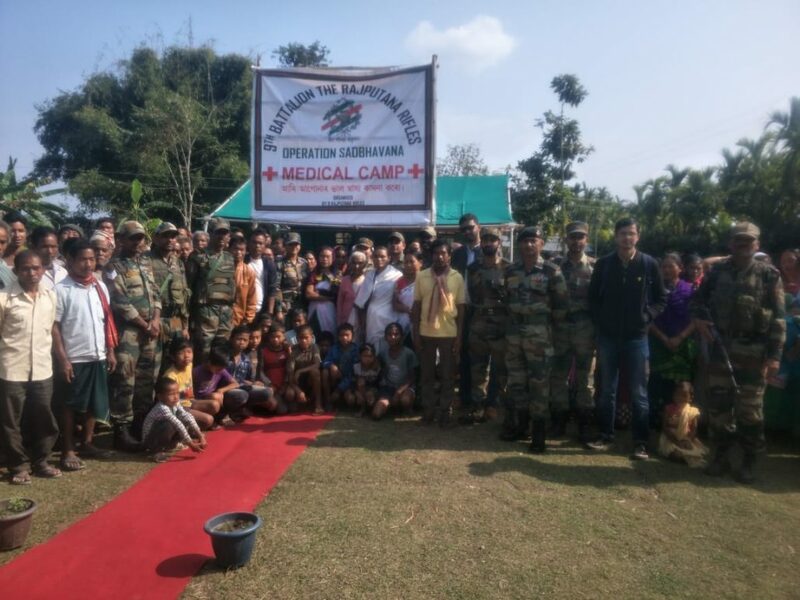 A free medical and health check-up camp was conducted by 9 Rajputana Rifles under the aegis of Dao Division on Wednesday at Lower Primary School, Rabha Gaon No 5 at Jagun in Tinsukia district of eastern Assam. The camp was organized for local population of Rabha Gaon, Assam Namphai, Deori Basti, Sonowal Basti and Lakla and the adjoining villages. A total of five Army doctors and three civil doctors from AMC were present to check up, provide treatment, consultation and counseling and medicines to villagers. The medical team included medical specialists, Ophthalmologists, ENT specialists and dental surgeon. The local population turned out in a huge numbers. A total of 826 villagers were benefited from the free medical camp. Army under Operation Sadbhavana has being taking a lot of projects for the betterment of backward society and area. The Laipuli brigade under Dao Division have recently started skill development centres in Pengri and Kakopathar in Tinsukia districts which are also very much appreciated by the local population.